It’s been more than a year since we introduced the Partnership Proposition Canvas as a prototype tool for modelling key business model partnerships. Since its introduction, we’ve been testing the tool and refining it. In this post we share the latest version, which has proven to be simple in use, and more effective in getting the conversation of business model innovation through partnerships going. Allow us to introduce the Partnership Canvas: an essential tool for designing, negotiating, and adapting partnerships. 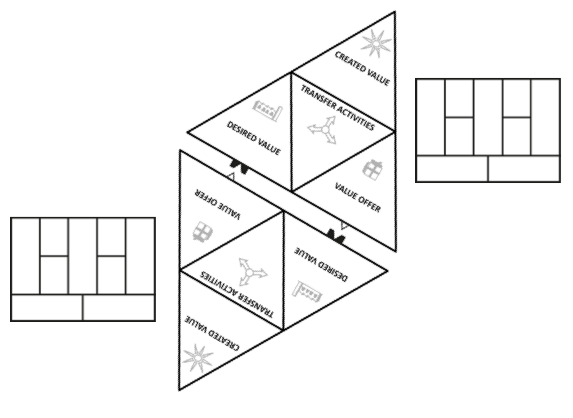 This tool works as an add-on to the business model canvas. That is not a good basis for creating a collaboration. People leave too many assumptions about their partnerships unaddressed, and that backfires the moment they go live. The first hurdle in the partnership discussion is definition of the term partnership. 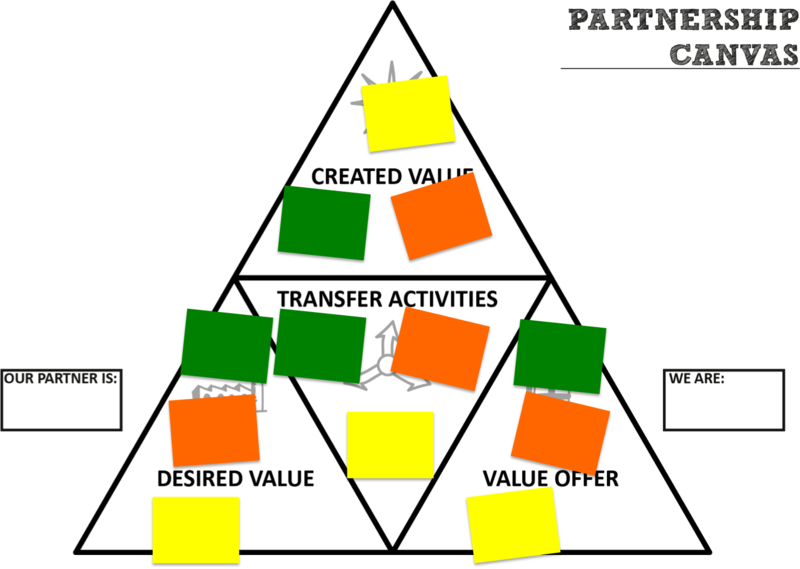 You won’t be able to define a partnership by only mapping out the two partnering business models. That describes the result of the partnership. It doesn’t explain how the partnership works. A partnership is more. It is an entity that sits in between the two business models that make up the partnership. This entity enables value to flow between two partnering business models. By combining value inputs from both business models in a partnership, they are able to create new forms of value that they both benefit from. (I’ve written about what can best, and best not be defined as a partnership from a business model perspective in a previous post). 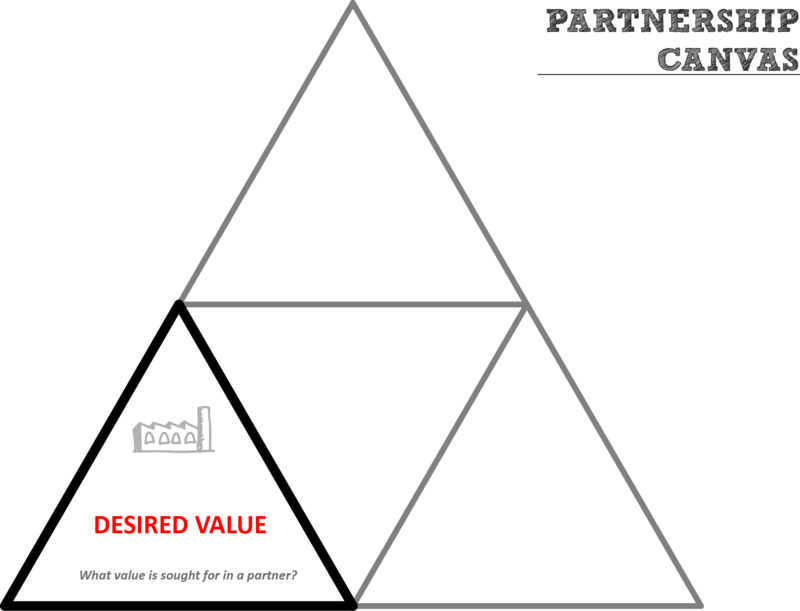 The partnership canvas was created to demystify the partnership entity by defining its building blocks. The tool can be used to map existing, and design new models for partnerships. The partnership canvas helps to break through the boundary of possibilities for innovating with only your own business model. The first question you need to ask yourself when orienting on a partnership is what will be the purpose of the partnership. The key to defining this purpose is to question yourself on how you can contribute to a better, more complete experience for your customer. This could relate to aspects of availability, convenience, speed, price, performance, etc. Based on definition of this purpose, you will be able to describe the missing element from your own business model, for which you are seeking a partner. You can use the definition of this element to screen candidate partners on a (set of )value(s) that you desire. This desired value makes for the first building block of your partnership design. The second question is about your own contribution to the partnership. If you have identified what value you desire in a partner, then you need to develop a matching offer that connects with that value. A value offer is required, which is based on one or more elements from your own business model. An effective offer either complements or enhances the value you would desire from a partner. Only if this connection is made, do you have a basis for creating a relationship. The third question demands clarification on how you will connect the desired and offered value. Through what collaboration activities or through what form will these values be connected? It is essential that both parties find a way to integrate the value that they are putting to the table. This transfer activity building block is the exchange by which synergy between the partnering business models is created. With this third building block, an engine is created that enables value to flow between partners. But the partnership discussion doesn’t end there. Essentially what we’ve defined so far is a basis for connecting values. The ultimate question is whether this value engine enables you to create a new form of value that you can utilize to innovate in one of the building blocks of your business model. This question on created value makes up the fourth building block of the partnership. 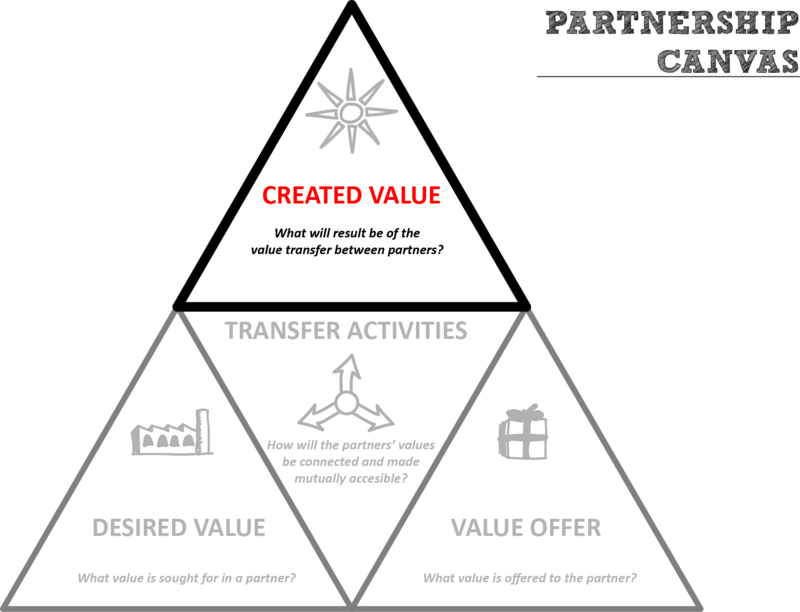 Once you have mapped your business model, and desired value from a partner, you can use the partnership canvas to see how you can connect with a partner. 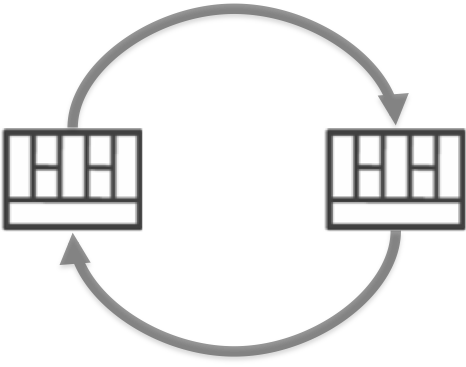 The value flow between the both partners is made by linking all the building blocks together through a single line of reasoning. Use post-its to describe the elements of your partnership. If multiple value elements are involved in a partnership, then you can use color coding of post-its to connecting lines of value exchange. Another important feature built into the design of the partnership canvas is that it enables communication between a business model and its partnership. 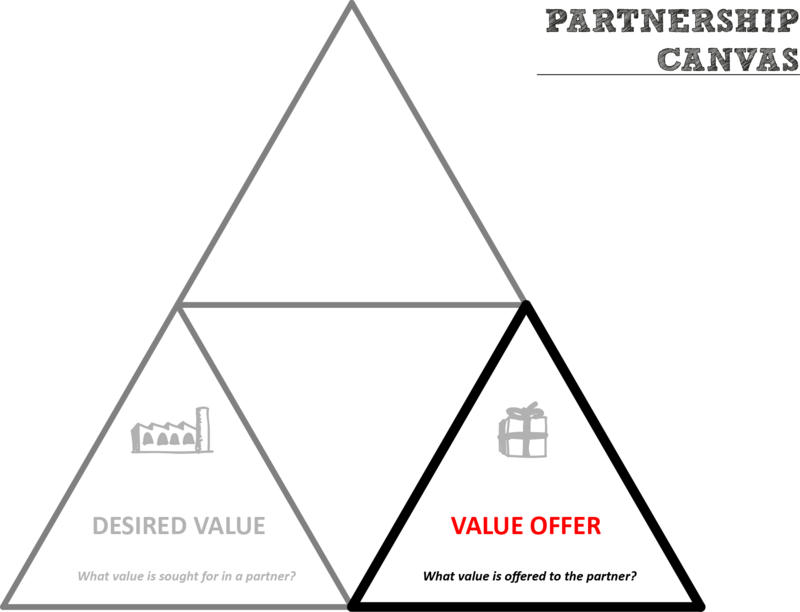 The value offer, and created value both have links to the business model of one the partners, and the desired value should relate to an attribute of the other partner. You have a same framing of the transfer activities, required to connect your values. The figure below shows how a partnership can be compared from the perspective of two partners, each with their own business model. By comparing two perspectives, prospecting partners can sense each other out early, and also learn from each other on the various opportunities that exist. Also, they can find out early on whether there actually is a partnering perspective in the first place. This might be a painful realisation to make, but it could save a lot of more hurt from a painful divorce in the future. The partnership canvas creates empathy between two prospective partners on the strategic importance of the partnership to each. The canvas can be used as a stand-alone tool to quickly identify a partnering opportunity. But for full strategizing value, it’s better to use it in conjunction with the business model canvas. 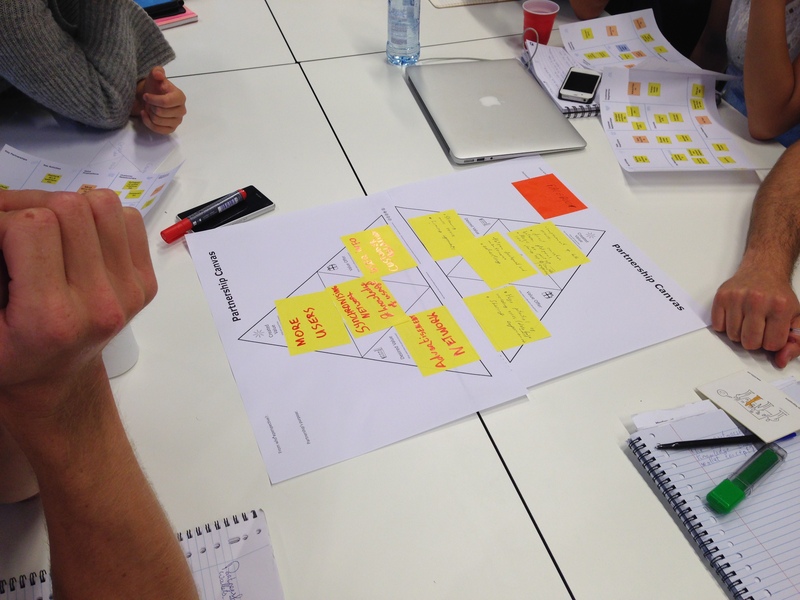 The partnership canvas has been tested in various workshop settings with students and entrepreneurs. It has demonstrably contributed to better partnership discussions. Parties become clear about each other’s strategic objectives. Also, they learn from each other about the various opportunities there are to partner. It’s not a matter of making one grand master plan for an offer the partner can’t refuse, but more of finding out together what the opportunities are. 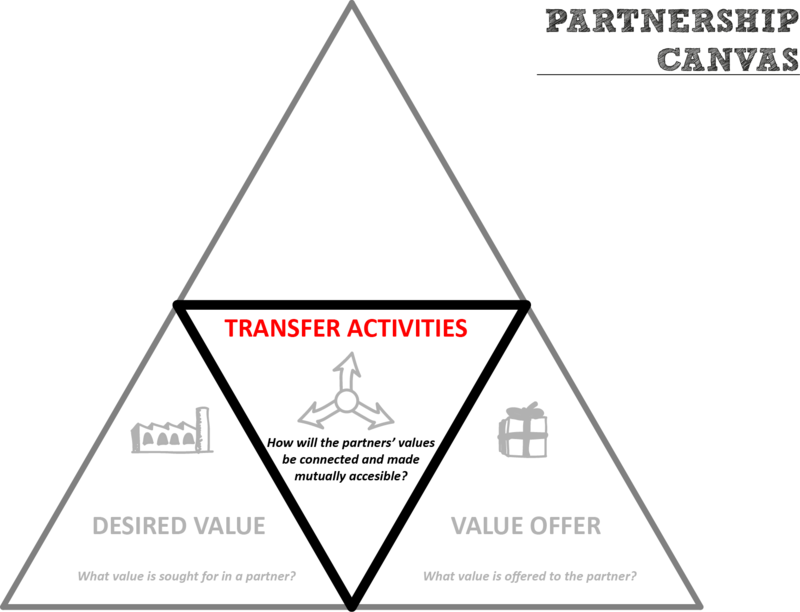 Stay tuned for more guidelines on how to use the partnership canvas on this blog. You can freely download, and use the partnership canvas [SlideShare login required, or send me an email: info@partnershipcanvas.com. The tool is published under a creative commons license, so it’s free, but please review back to the source. I hope to hear from your experiences! Interested in a training on the Partnership Canvas? If you want to learn more about using the partnership canvas, then check out our Partnership Design training options. I couldn’t have developed this tool without the help of some special people. First I would like to thank my colleagues and students at Wageningen University for creating opportunities to test out the canvas. Next, I would like to thank Mike Lachapelle for some really foundational feedback on the design of the canvas, and Salim Virani for some interesting pointers on shapes. Lastly, a huge thanks goes out to Ernst Houdkamp, whose visual thinking skills kept me sharp on finding improvements for the canvas, and who had the patience to stick with me through the many iterations of the tool. Thank you Wim! You have been key in encouraging me to continue, and improve partnership thinking, and practice.